Upon its release in South Korea in 2008 then in North America in 2009, DJMax Technika caused a revival of the music game genre with its touch screen and its mix of techno and Korean pop songs. A dedicated community has quickly rallied around this unique game. DJMax Technika saw the release of two follow-ups in 2010 and 2011. What was the surprise of the players when Neowiz shut down the servers dedicated to the game in 2013, removing three quarters of the game content in the process. Gradually, the community dispersed... It's a sad story to be told in a documentary in preparation. Entitled "Touching Sound: The Technika Documentary", this coverage directed by Nick Dobkin includes numerous interviews with players during the Best of The West 3rdStyle music games tournament held in Sunnyvale, California in August 2014 but also impressions of prominent members of the community. Funding for the making of the documentary is made via Kickstarter where you can watch a video presentation of the project. Currently, there are 7 days left to gather the missing $380 needed to reach the $6,500 goal. By funding the project, you can get a digital version of the documentary for $15, pre-order the DVD will cost you $30 and $40 for the Blu-ray (plus $10 for shipping outside the US). Your support would be highly appreciated because in a time where arcade games lack exposure in the media, this story deserves to be told! Capcom just opened a its new arcade game website: crossbeats REV. crossbeats REV. It will be the first rythm game fully produced by Capcom. 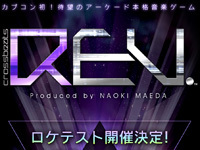 It will be produced by Naoki Maeda who formerly worked on BEMANI games as DDR. A first location test will be held at Plaza Capcom Kichioji from January 31 to February 1st. During the location test, the players could get 3 different stickers, if they get the 3 stickers, they can get a special CD exclusive to the location test or a special code to unlock the song "Reseed (Another Edit)/quick master" in the game. 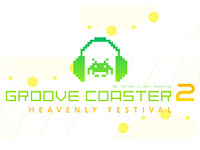 Taito's Groove Coaster sequel starts operation today: this is Groove Coaster 2 Heavenly Festival. The gameplay is the same than in Groove Coaster but the cabinet and the game interface is coloured in green. New features are added like a new ranking function. 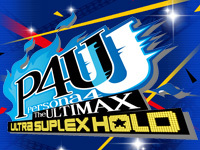 Arc System Works releases Persona 4 The Ultimax Ultra Suplex Hold v2.00 (NESiCAxLive) today. This update brings the 5 exclusive characters from the home console version: Rise Kujikawa, Ken Amada and Koromaru (as one character), Tohru Adachi, Marie and Margaret. The game has also been rebalanced and the "shadow mode" has been redesigned. SNK Playmore posted an interesting announce on Twitter yesterday. 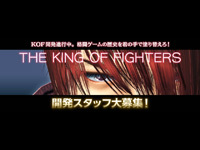 They are looking for game programmers, technical designers and designers for a new King Of Fighters game! We don't know if this game will be released on an arcade platform but it wouldn't be surprising knowing the KOF history. The candidates must be involved in 3D consumer games and have experience in C and C++ coding for the programmers and MAYA, 3D Studio MAX, Softimage, Zbrush, Photoshop and Scaleform for the designers. You can seen the recruitment page here. 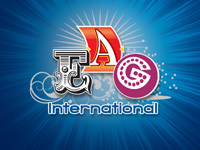 Like every year, Sega Amusements Europe will be one of the must see booths at EAG. The number of exhibited products is still impressive this year. First, the star attraction will undoubtedly be the racing game Showdown. As GRID, it is developed by Codemasters. It will be presented in 4-player cabinets featuring moving seats and 65" LCD screens. The new versions Super Deluxe 80" of Transformers Human Alliance and Deluxe 60" of Plants vs. Zombies will also be showcased. New redemptions Pirates of Monster Island and Kung Fu Panda Mojo Dojo will be presented for the first time in Europe. Visitors could also try Gold Fishin', the new title in Sega Amusements's skill game series and the new shooting galleries Pirates and Captain Black's Treasure. On cranes side, there will be the new Mini Key Master and Grab and Win, the result the collaboration between Sega Amusements and ICE. For the children, Hello Kitty air hockey will be highlighted. As usual, we also find Sega Total Solutions and Sega Prizes Europe on the same stand. 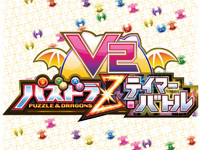 The sequel of Puzzle & Dragons Tamer Battle Z, released in June, is available today. GungHo Online and Marvelous wasted no time to make a V2 with new content. New monsters and new evolutions are coming with this update. A trailer showing the new features is available here. 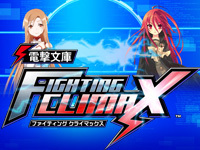 Dengeki Bunko FIGHTING CLIMAX Ver.1.30 is available in Japanese game centers today. New character are added in this version. Akira Yuki (Virtua Fighter) and Selvaria Bles (Valkyria Chronicles) are the new playable characters. The new support characters are Dokuro-chan (Bokusatsu tenshi Dokuro-chan), Accelerator (Toaru Majutsu no Index/) and Izaya Orihara (Durarara!!). The global launch of Time Crisis 5 will take place at the EAG International show in London on January 13. As previously announced, this new episode uses two pedals to move between several strategic points around enemies. Once again, Bandai Namco Games draws out the big guns at the European trade show with the presence of many new titles: In addition to Time Crisis 5, visitors will be able to try Star Wars Battle Pod, the Star Wars game using the same cabinet as Mach Storm (with a 180° screen), the Lost Land Adventure shooting game using a semi-spherical screen, Mario Kart Arcade GP DX, Super Alpine Racer and Dead Heat Riders. Also featured are the latest Raw Thrills games including the upcoming Jurassic Park Arcade and the very good Aliens Armageddon. For the first time, titles from Adrenaline Amusements will be presented on the stand of Bandai Namco Games including the arcade adaptations of Candy Crush Saga and Flappy Bird (Flying Tickets), Blackout, Jetpack Joyride Arcade and the new range of Touch FX games. Namco's mascot is not forgotten with many themed machines and a new range of Pac-Man plush toys. There will also be technological curiosities from Jennison Entertainment Technologies (JET) such as Ocean Pearl which uses "black screen" and Citrus Fruits Whacker that exudes the appropriate scent when a fruit is whacked... There will be many other things to discover, so be sure to check the Bandai Namco Games booth at EAG International 2015 on January 13, 14 and 15. EAG is approaching slowly and exhibitors begin to publish the exhibited products list. JNC Sales unveiled its line-up yesterday. This year, they will showcase more new products than any previous year. The latest video games from IGS distributed by Wahlap will be on the stand: the racing game Overtake, the 4D shooter Monster Eye and the interactive kiddie ride Go Go Pony. The kiddies ride Midi Kiddie Submarine and Kiddie Fireman by Tecway will be also featured. JNC Sales announces the lastest Harry Levy pusher: Jurassic Park.